1. 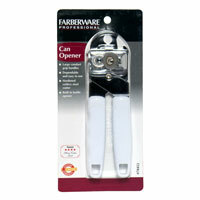 Holding can opener with handles open, place cutting wheel over rim of can. 2. Squeeze handles together and turn knob clockwise. Leave a small portion of lid uncut. 3. Remove can opener from can by opening handles. Bend lid of can back to remove contents. 4. To care for your new Farberware Can Opener, do not immerse in water to clean. Use damp cloth to glean gear wheels and towel dry. Made with real lemons. 3% Lemon Juice. Fresh roasted FLAVOR.FINEST From the fields.At hampton farms, our family has been farming since the early 1900'S. today, we remain family owned And committed To producing the finest snacks available. We select only the best peanuts And roast them the old fashioned way, with no oils or preservatives added. This releases the delicious, pure roasted peanut flavor. Enjoy, And thank you for choosing hampton farms... The finest From the fields! Also be sure To look for our special flavor roasted-in-the-shell peanuts And other fine SNACKS. Thaw'n serve. With a name like Smucker's, it has to be good! Smucker's Uncrustables sandwiches seal in the homemade goodness of PB&J with freshly baked bread. Moms love 'em because they're wholesome and quick. Kids love 'em because they're delicious and crust-free. Smucker's Uncrustables sandwiches - just thaw and enjoy! What are Uncrustables Sandwiches? We take fresh, soft, bread, spread on creamy Smucker's peanut butter & delicious Smucker's jam, remove the crust, then freeze to seal in the freshness! All you do is thaw and serve!